My first piece of writing with spirit in 2014 happened in the first few minutes of the new year. I’d elected not to go out, it was peaceful in my flat and it seemed a good time to attempt something about which I felt not a little trepidation. A very dear friend had a question of spirit, the answer to which I was going to attempt to provide by asking one of my friend’s guides to write through me. I didn’t as yet give sittings outside my mediumship class and though I was used to giving other circle members messages, this felt like a whole new level of intimacy and responsibility. To say nothing of the fact that I was doing this remotely, without said friend being present to help bring in her guide. To add to the challenge, my friend’s question was all about her guides…did it matter that she didn’t know precisely who they were, their names, their histories? And was it the right time to embark, with them, upon the spiritual work she’d set her heart on? Oh heck. But as I have frequently been told and frequently have to remind myself, working with spirit is all about trust – trusting myself not to get in the way and trusting spirit to get the message right. They did just that and with such love. My friend has kindly given permission for me to share her guide’s response here. As I write with your friend the fireworks compete with the rain, just as humans forever pit themselves against the forces of nature. And by that I mean of nature in general, and their own natures, too. It is a part of the human condition, the human experience – and an important, nay essential part at that – for you to rail against that which your instincts say is true, or habit, or just, or easy. You fight – and often you lose and sometimes you win. What you yourself recognise, but many do not, is that you often learn more in the losing than in the winning. Winning most often comes when all the lessons down that particular avenue of losings have been learned. Only then can your soul direct you to the correct choice and somehow the victory does not always bring the thrill you thought it would. It is a short-lived pleasure because, after all, the new challenge, the next curiosity, is far more engaging. You may wonder what all this has to do with your question, but yes, it is pertinent. You are curious about the nature and identity of your guides, your helpers in spirit. You wonder who exactly we are, what are our names? Have we ever lived on your earth? Who were we and what did we do there? Did you ever know us in a previous life? What should you call us now, how should you envisage us? Your curiosity knows no bounds. There is nothing wrong with curiosity. But I beg your indulgence for a while longer, my dearest. I beg you to ask yourself, if you were caught in a storm, without food or shelter, and a stranger emerged out of the gloom and offered you a supporting arm, an umbrella, if he led you to a warm shelter and cooked you a meal. If you knew from the start, instinctively, in your heart of hearts, that you could trust him, that he wanted nothing more than to comfort and assist and support you. If you knew that he was there only to supply what you needed to gain control of the situation for yourself and to give you the tools to move on under your own steam before he waved you goodbye and stepped back out into the night… If you knew all that, would the experience be any less meaningful for having never known his name, or what his profession was, or why he seemed so familiar, so safe? Yes, you would be curious, but would the encounter be any the less for that lack of facts? We are many such ‘strangers’ – familiar for all that you do not know our names. Dear and beloved though you cannot recall how we came to be so. We appear when we are needed, we each have a role to play – specialisms, if you like, that can help you as you evolve in this life, as your wonderful path unfurls beneath your feet. Call us what you will. Imagine us as you will. Create the story of our previous life or lives together if you wish to, as you will. For as a teacher once told you and as you will hear again and again in your journey with spirit, when you open your mind, please trust the thoughts and sounds and images that come. You know you were called Rafaelo in your life in Malta. How do you know? Because you were open to receive the sound of your name. As you feel us draw close, single us out. Become accustomed to asking for whichever one of us specialises in what you wish to do at that moment. If you wish to heal, or learn of healing, call upon your healing guide, then meditate with an open mind in that guide’s presence. Ask that they show themselves to you, speak to you. You will hear their name in your mind, you will come to see them if you so wish. Trust the images you get. Trust the feelings and the gnowings, trust the physical sensations – the smells and the sounds and the colours. Develop your own lexicon as your friend spoke of developing hers – lexicons do not only consist of words. In short, trust is the key to learning the details you so yearn for. The knowledge is all there – it is not hidden, but neither is it essential to the work and the journeying we do together. Do not let its lack become a barrier to the true achievements and harmony and fulfilment. Let the details, unimportant and yet we acknowledge tantalising, emerge naturally as the flower unfurls from the bud. They are but the fragrance, not the flower itself. And from the flower comes the fruit and the fruit provides the true sustenance. As you relax into the work, into the journeying, the knowledge, the familiar details you yearn for, will come to you. It will be as if you brush the cobwebs away from your face and there, there is his or her beloved face before you! And of course you know their name! And that smile – how could you forget, since the first time you saw it in this place, at that time? Oh the joy of instant recognition! Strangers no more; nor ever were. As for me, you will find me ever in my garden. At its centre a well – the giver of life. I will tend and prune and weed; my work will be battered by storms and droughts but life will inevitably survive and burst forth. And there will be long lazy summer days, warm October evenings, frozen days where the icicles shine like daggers in the sun and the spiders’ webs are stretched across the path like glass snowflakes. Come to me when growth is slow or seems to refuse to happen. Come to me when you thirst for knowledge of how to take things to the next stage of transformation. Do not always expect an immediate solution, for all seeds take time to germinate, some longer than others. Some need to over winter in frozen ground more than a turn or two before they emerge. Others never grow tall but are small and beautiful. Some need shade to thrive, others stretch and strain for the sun, only happy in its blinding light and warmth. The garden has room for many things, as the garden of life has room for many people. Gardens benefit from variety, from the beneficial interdependence of many species, each beautiful in their diversity. Such is your life and those of others around you. I am Brother Marcus and you knew me once. You will discover more as we journey together. You often found me in the garden at the abbey. It was my work but also my pleasure. I found God in the soil and the face of a flower as often as I found him in the chapel. Sometimes I wondered if you knew or noticed Him at all but in my heart I was sure that He knew you and that was what mattered. You were a good man and in so many ways that is more important that being a pious one. In your new journey all your compassion will be called upon and you will not be found lacking. To be a guide but not a leader is a challenge. To provide succour and support but then let the spirit fly free to its own reward…ah, what a calling, what a heavenly burden! Come to me in the garden when the burden seems great, when the sadness of others visits heavily upon you. It is a peaceful place; I am a quiet man. The peace of this place, the warmth of the sun, the coolness of the breeze, the richness of the loamy soil between your fingers, will sustain and comfort you. To answer your question, the time is right. It is never wrong. Live each moment and each experience as it comes, fully and with pleasure and acceptance. All you wish to know is within your grasp but do not grasp for it. Instead, let it come gently to you, as your mind opens and the knowledge whispers itself to your heart. 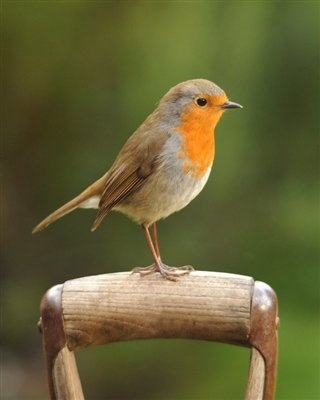 Like the robin who sits upon the branch, watching me work, until one fine winter’s day, seeing me pause to wipe my brow, and knowing after many months of silent companionship that I am no threat, he hops upon my hoe and sings his heart to me. We will sing our hearts to you. Listen, listen. Buenos noches. You are welcome in my garden whenever you wish it. This entry was posted in Written with spirit and tagged inspired writing, spirit guides, trust on August 1, 2014 by louisebwylie.